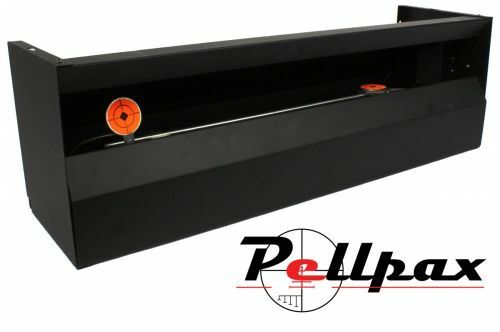 Polish of your aim with this High quality Moving Air Rifle Target. This box has the ability to be both free standing or hung up thanks to the holes located in the top and the back. Powered using only 6xAA batteries this moving target is an ideal way for practising and improvising your aim and provides hours of endless fun. Using a cam belt system to move these targets this electronic moving air rifle target has 3 different speed settings. This provides you with the option to choose which ever speed best suits you best. The knock down target once hit will reset itself when it comes back around allowing you to continue shooting for hours on end.